The efforts on the "Clean Technology Tower" are not just about embracing the rhetoric of green. 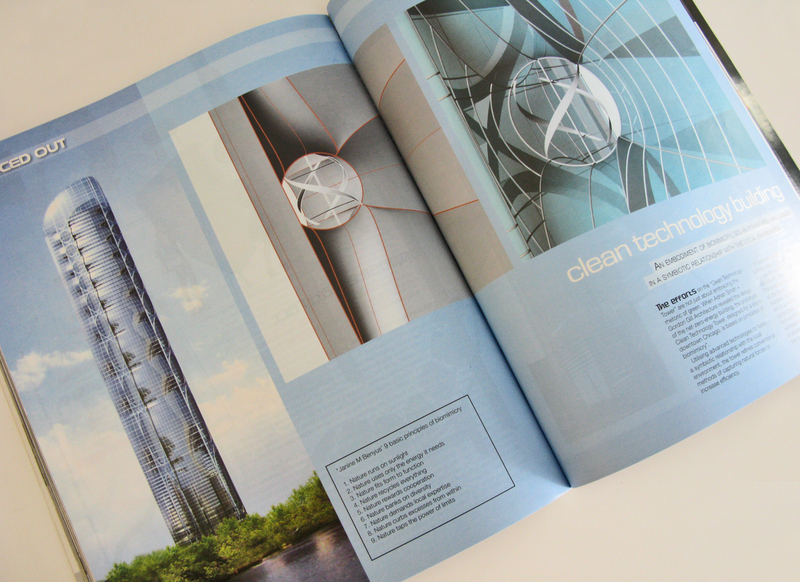 When Adrian Smith + Gordon Gill ARchitecture revealed the design of the net-zero-energy building, the prototype Clean Technology Tower, designed for a site in downtown Chicago, is based on principles of biomimicry. Utilizing advanced technologies to foster a symbiotic relationship with the local environment, the tower refines conventional methods of capturing natural forces to increase efficiency. In response to local wind patterns, turbines were located at the building's corners to capture wind at its highest velocity as it accelerates around the twoer. The turbines become increasingly dense as the tower ascends and wind speeds increase. At the apex, where wind speeds are at a maximum, a domed double roof cavity captures air, allowing for a large wind farm and the use of negative pressures to ventilate the interior spaces. The dome itself is shaded by photovoltaic cells that cature the southern sun. Designers Adrian Smith and Gordon Gill emplasize that, while the prototype design revealed is specific to a site in downtown Chicago, the design's guiding principles and applied technologies are universal. "We think of each building as an instrument," said Gordon Gill. "As architects we form and tune the building to optimize its performance. To limit environmental impact and ppotimize clean energy production a building must be designed in synthese with its context - both locally, in terms of its site, and globally, in terms of available and developing technologies." "Our philosophy of 'global environmental contextualism' is universal, but our designs are site-specific," said Smith. "You could build 'Clean Technology Towers' in other cities across the globe and each one would be distinct." As designed, the prototype Clean Technology Tower includes over 1.8 million sq ft of office space, 300,000 sq ft of hotel space, a spa and street level retail. Office space is located on high floors to miximize available views and take advantage of the direct natural daylight. Dedicated elevators will provide access for both office and hotel tenants to all of the tower's amenities. The tower's domed top offers unrestricted skyward views, creating a truly modern, grand atrium space.